Dining area is a place where people have their food and casual drinks. People construct a room for placing a dining table and chairs which we known as dining area. Generally people place their dining table in kitchen so that it is easy to serve food and can prepare food on it. But few people arrange it separately. There are few kitchen designs of L shaped with an island and this island can also be used as a dining. People usually use the dining table of large with chairs, the most common dining is the rectangular table. In the modern times people are using different designs of dining table and are decorating the interior of the dining area with the dining table, chairs, closets, cabinets, tv unit, flower pots and even fabric crafts mounted on the walls. Here are few interior designs of modern dining room which are looking elegant. If you are looking for a modern design for a dining area you can choose these designs. The interior can be decorated with following designs either it may be a large space or small space dining area but choosing of dining table may differ based up on your taste and space of the dining room. The dining room looks modern with the palisade dining table and wooden leg chairs. Minimum of eight people can be seated for consuming food. The Dining table is served with the cups and a ornamental plant. The false ceiling is a suspended false ceiling with simple lights and a massive chandelier is attached to the roof. The flooring is made of ceramic tiles which is glossy and the room has decorated with a grey wall paper and a painting is mounted on it. On the other side there is wall cladding with a large size mirror and has a closet which is decorated with the drinks, clock and a flower pot. The entire dining room looks amazing. 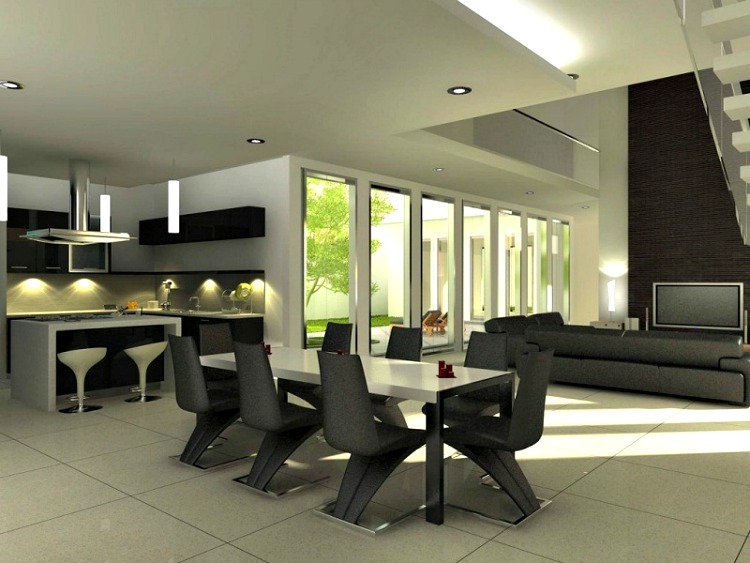 In the view of the image you can see a modern dining area which is decorated and is elegant. The dining table is made of wood which rectangular with the Eames dining chairs and is a eight seater. The interior is decorated with wooden cladding and has cabinets to store the groceries and it also has an abstract painting. The false ceiling is dry wall ceiling with plain light fixtures and pendant lights. The room has wooden blinds from where we can see outdoor garden and get fresh air. The flooring is made with sparkling tiles. The dining room interior is suitable for large space dining areas. It has modern glass dining and has wooden leg chairs. The dining table has many goblets, flute, wine glasses, ceramic plates and flower pots. The flooring is made of laminated hardwood and has a thick textured carpet on it. The interior is designed with wooden panelling with a frame on it and has a fire place to make the room warm. The false ceiling is decorated with the designs and has a modern contemporary crystal pendant light. 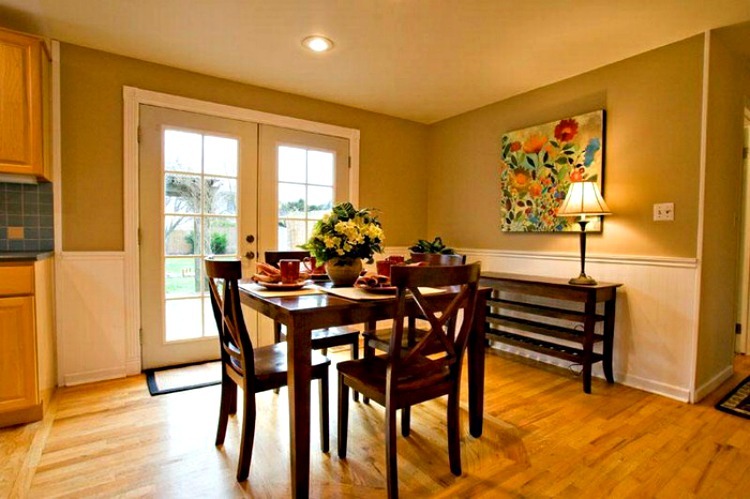 The dining room is simple and elegant. The dining table is rectangular in shape made of wood and is rectangular in shape and has leather covered chairs. The flooring is made of warped wood with a plush carpet on it. The interior is decorated with the beige soft colors which has frames and painting with the theme of a beautiful girl. The room has casement windows for outdoor view. It has cabinets which store ceramic jars, cups and has flower pots on it. The dry wall ceiling has a pendant light. The dining room looks modish with all the elements in it. It has a long rectangular wooden table with the arm chairs. The table has candles with a orange rug and the flooring is made of ceramic tiles. The false ceiling is drop out ceiling with a drum type pendant light. The room has wall cladding with the closets which is decorated with the vases. The dining room has ornamental plants which gives a fresh look. The room is adjacent to the living room with modern couches and colorful pillows. 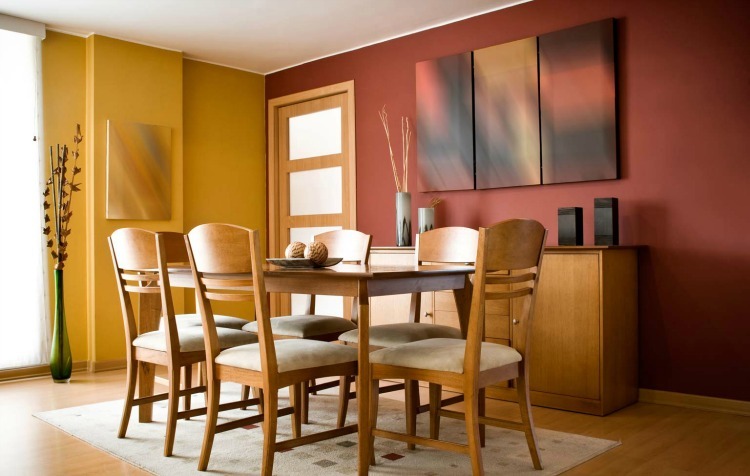 This dining room looks fantastic with the color contrast of canary yellow and maroon. The flooring is made of warped laminated hardwood and has a cream plush carpet. The dining table has wooden chairs with rectangular shaped dining table and has ceramic plates on it. The interior of the walls has abstract painting which matches its color. There are cabinets with chest of drawers and has vases on it. The ceiling is a drywall ceiling which is simple and plain. 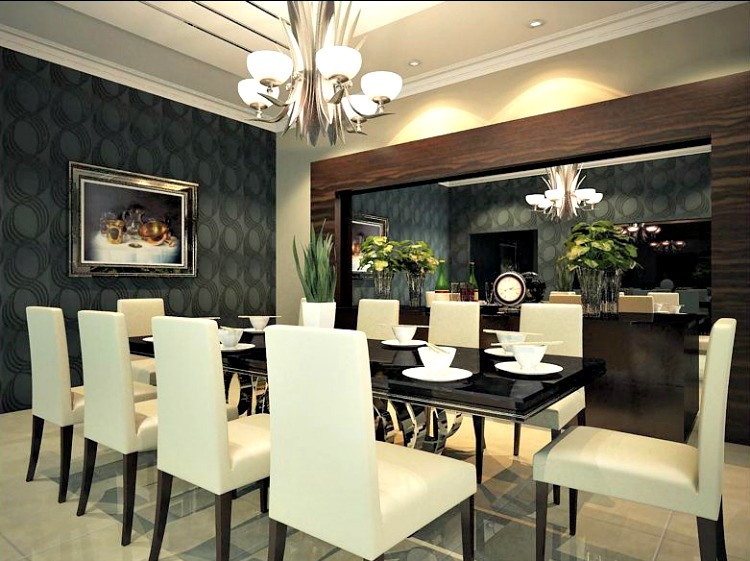 The dining room looks amazing and if you are looking for a small space dining interior then this design is apt. The dining room is adjacent to the kitchen which will be easy to serve food and prepare food. The dining table is made of rectangular shape wooden table with stainless steel legs and has hulsta chairs which are modish. The dining table is decorated with ceramic plates, globets, wine, flute glasses and has beautiful red tulips. The kitchen has counter, flat wooden cabinets with a faucet, microwave oven, chimney and counters. It also has island with chairs for consuming casual drinks and to prepare food. The room has closets and has stored books in it. The flooring is made of hardwood and has a smooth blue plush carpet. The false ceiling is a dropout ceiling with the light fixtures and has a pendant light attached to the roof. The dining room is baronial with the modern couches and has wall cladding in the interior mounted with the television. The dining table is placed in the open kitchen which has chimney, wooden panelling, faucet, stove and island for making food. The flooring is made of ceramic glossy white tiles. The dining table is made of white wood and has ultra modern contemporary chairs which gives a cozy look. The false ceiling is a dry wall ceiling with the plain light fixtures. The room has also a stair case to reach up and has picture windows to view the outdoor garden. In the view of the image you can see a modern classy dining room. It has dry wall ceiling with simple light fixtures. This dining table is adjacent to the kitchen which has wooden cabinets and counters. The false ceiling is laminated hardwood with a carpet. The dining table is small and is rectangular in shape with the wooden chairs and is decorated with the ceramic plates, glasses and a flower pot. The interior is decorated with the acrylic flower painting and has a night stand with the lamp. This dining room interior is ultra modern and is cozy. The dining table is rectangular in shape with the ornamental plants decorated on it and has wooden leg chairs. The flooring is made of wood with a saxony grey rug on it. The false ceiling is a grid ceiling with the massive pendant lights attached to the roof. The interior is decorated with the green shades wall paper and wall sconces. The interior also has wooden cladding and has a stair case.